So here we have the Great Southern Stand, obviously under construction. The year is 1991, and things have changed dramatically at the ‘G from a year earlier. 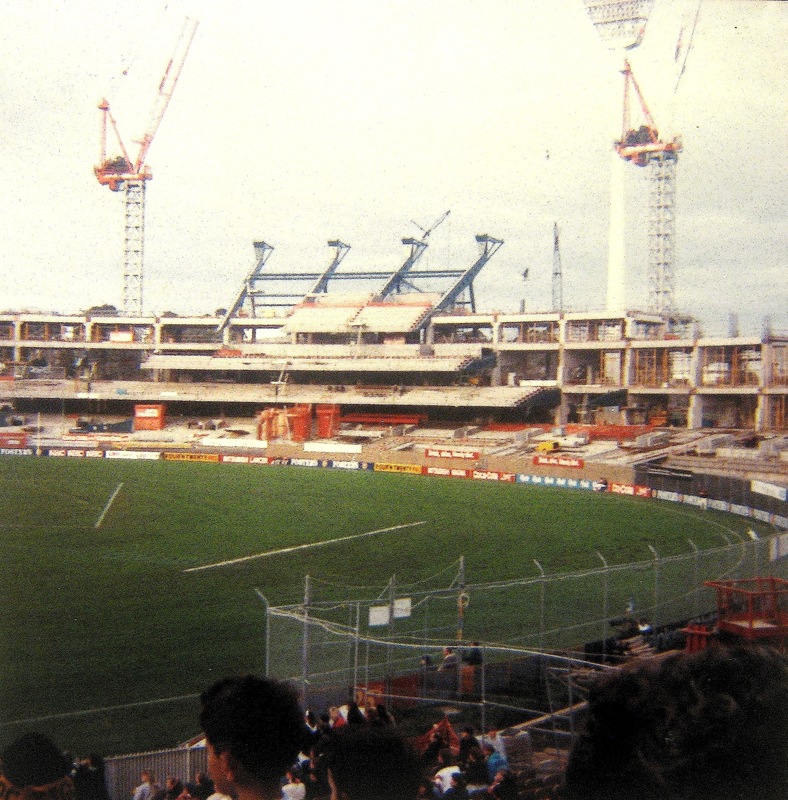 I can’t remember if this was the game against Sydney or St.Kilda as we sat in the same spot for both, but the focus here is clearly on the enormity of the impending structure, now looked down upon by the Ponsford, Olympic and MCC stands. And when looking at the ‘G in this 1991 state, I automatically think of the enigmatic Allan Jakovich. And of course, who could forget Brett ‘Fruity’ Allison’s 1991 mark of the year as he stood atop Gavin Crosisca…and then kept going up! All in front of the new stand being built. Thanks for bringing this to my attention Jeff Dowsing! Something which is sorely missing from league grounds these days is contrast. Stepping out from the dank innards of a grandstand to the bright contrast of the outer was something I cherrished. This pic was taken prior to the 2006 VFL grand final beetween Geelong and Sandringham at Carlton’s Princess Park, yet it is symbolic of many an old league venue. Adequate lighting in the stadia of today is clearly a necessity especially as we play a lot of football at night. But it’s a feature I miss. Ok….so I’ve strayed slightly from football, but seeing as the Boxing Day test is currently playing out down at the MCG, and what with my love of grandstands and stadia, this photo seemed apt. 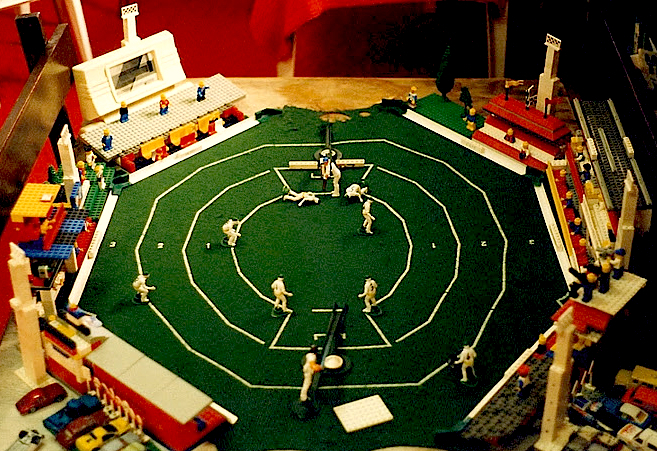 Yes, straight from 1994, it’s mine and my brothers Test Match game on steroids, with much thanks to our extensive collection of lego. Note the Richmond fan standing on the grassed area, and the red & green 3rd umpire lights adoring the ‘main stand’, as was the style at the time. Click on the below thumbnails and see the oddly placed cameramen (a la Waverley Park cameras in the pocket) and the apparent car accident in the car park! 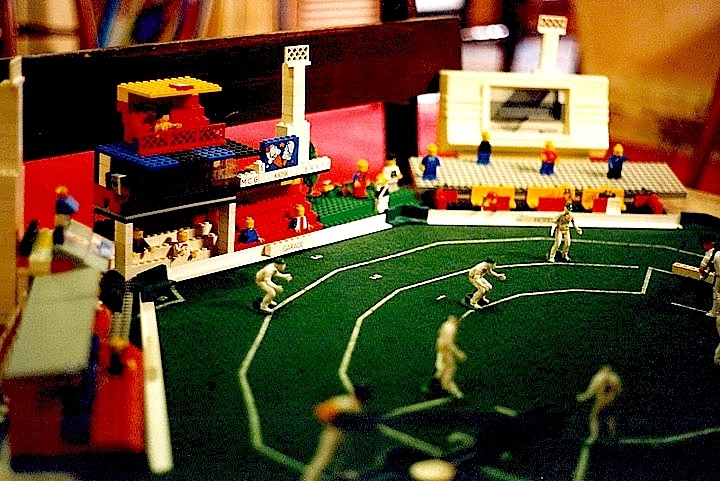 Most of the grandstands have survived and are sitting around somewhere at mum and dads, but the test match game has long since disintegrated. Thanks to mum for the pics!